Welcome to Go Madd 4 Massage. 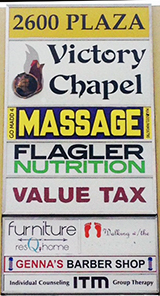 For more than a decade, we have provided St. Augustine with both in-office and out-call professional massage services. We take pride in the quality of our work, as well as the excellent customer service experience we provide. A massage is more than just a physical relaxation for your muscles—it should also be a rejuvenating and stress free oasis, giving you the time, space and care to renew your energy and enjoy some peace. 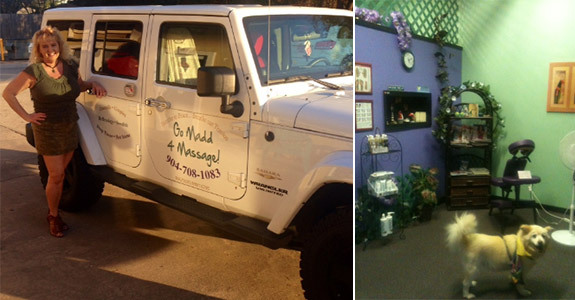 Here at Go Madd 4 Massage, we strive to always provide that kind of empowering massage therapy in St. Augustine, FL. We have been in business as a locally owned and operated company since 2004, and over the last decade we have developed a loyal following and a strong word of mouth reputation for high quality massages, flexible service and a welcoming, relaxed environment. Availability: Flexible appointments available 6 days/week, and Sundays, evenings, and early mornings available as well. Standard appointment times are Mon – Sat, 10am -6pm by appointment only, subject to change without notice. Sundays are not available unless booked in advance for appointments. Same day and next day appointments may be available. Privacy & Confidentiality: Please note that a sign on the front door states *Massage in Session* . The door is locked & will be opened for the next client. This ensures privacy & confidentiality for all clients. Please wait outside in the comfortable chairs provided until the therapist is ready for your session. If it is raining, then please wait in your vehicle. There is an awning above the chairs, but we want you to be comfortable until we are ready for you. Please know that even if we get behind by 10-15 minutes due to individual attention or busy scheduling, that you will get your full time & focus. We aim for consistency & great massages. Your help is appreciated in this manner! My sweet & friendly dog Praline used to come to my office every day to greet clients. She was unfortunately put down December 15, 2017 at age of 17.5 due to complications of arthritis, cataracts, & a brain tumor despite acupuncture, rehab, & adjustments. I was her caretaker for 18 months as I fed her in my arms like a baby & many times used a stroller for her. She will be greatly missed, & I made a memory book for her. After many months of grieving, I just got a new dog named Wrangler on Mother’s Day 2018. She will not be at the office at this time. Payments & Gift Certificates: Payment is due at the time of service. Please inform Diana if you have a gift certificate upfront when booking appt or if you have a coupon or special deal so there is no confusion about the type of massage or pricing. If you do not present the gift certificate, coupon, or special deal upfront before massage starts & have not informed the owner of the full situation, then you may have to pay full price in order to receive the massage. Please note that as business owner, I can dishonor any situation that I deem disrespecful, rude, or offensive to me & my business. We are here to serve you the valued customer & it is a win win situation when there is mutual respect. Invoices: If you need an invoice for business or medical reasons, then please let the therapist know. At the office, it can be filled out on a form. For mobile services, it needs to be emailed to you. About Our Business Name: The ‘madd’ part of Go Madd 4 Massage stands for make a difference daily which is something I strive for both in personal & business life. Drink plenty of water after a massage and for the next 24 hours, even more true if your first massage. Please let the therapist know if this is your first massage. It is normal to be nervous or anxious about your first massage as you don’t know what to expect. Relaxation music will be played during a massage unless requested otherwise. As part of a professional massage, all clients are draped with a sheet or towel as part of state law. Advise the therapist of any bruises, medical problems, or concerns. We offer same day and last minute appointments, so text or call Go Madd 4 Massage today!